Yes, it’s possible to stay on top of the news entirely from within Twitter and Facebook … but it takes work. Following the right number of people (so as not to get overwhelmed) posting about a broad variety of topics (so as not to leave oneself ignorant) is an inexact and tedious science. And call me cynical if you must, but I don’t trust my real-life friends to keep me informed, either: Absent the professional news organizations I follow there, my Facebook news feed would be largely pets, music videos and distressed chatter about how winter is, evidently, cold in some places. All of this is a roundabout way of making the case for NewsWhip, a Dublin-based startup trying to beat Twitter and Facebook at their own social-news capabilities. 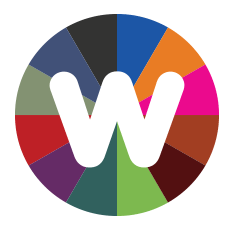 NewsWhip claims its site automatically pulls in and ranks the best trending stories of the moment from Twitter and Facebook, based on aggregated and weighted data of what the world is tweeting, sharing, liking and commenting on. 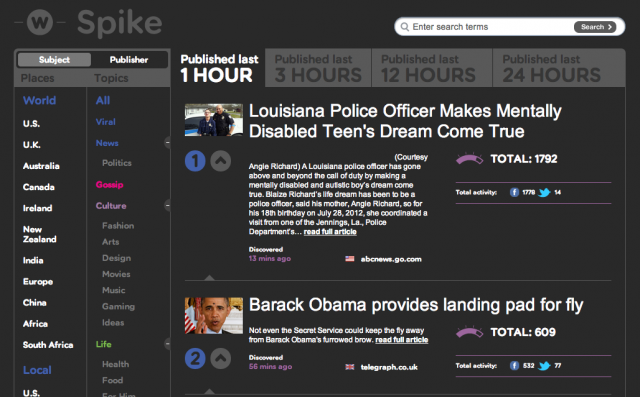 The faster a recent story is spreading online, the higher it moves in the rankings. Users of the free site or mobile app are greeted with a single column of stories from around the Web, which can be filtered by topic or location. A sister site for news professionals, Spike, lets paying subscribers filter even further by time intervals (“published in the last hour,” “published in the last three hours,” and so on). So you’ll see a mix of stories that provoke outrage sharing top billing with pop-culture watercooler fodder in the default “Worldwide” section, and not so much “real” worldwide news of the same moment, which usually makes it to the top of that other little aggregator, Google News. And within certain topics, the absence of human editors is sorely noticed: I came to the technology section yesterday afternoon expecting something similar to the homepage of (human-edited) Techmeme, with stories about Microsoft’s Q2 or the rocky launch of Twitter’s video app, Vine. No such luck. Instead, one of the top articles in tech was “GRAPHIC: Girl Puts Apparently Bloody Tampon Where It Should Never Go.” Thanks, but no thanks, Huffington Post. 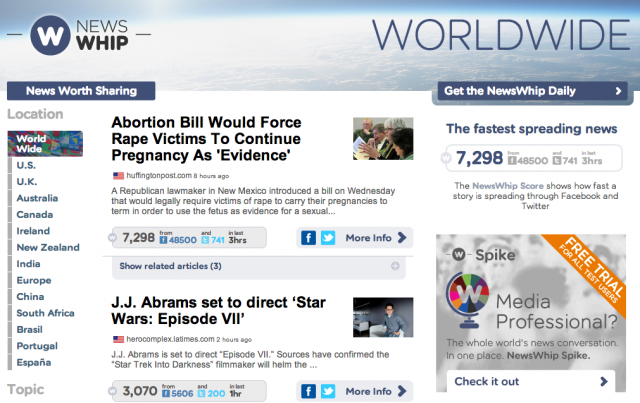 Still, NewsWhip has potential amid a crowded field of curators and aggregators, and even in the short term it could be a decent alternative news source for, as one example, the majority of American adults who have never seen news on Twitter or Facebook. It’s a good surface glance at the zeitgeist, and for some casual newsreaders, that’s enough.